One thing that surprised us upon seeing the tower up close is just how much beautiful detail was incorporated into the design. Want to see more of this trip? 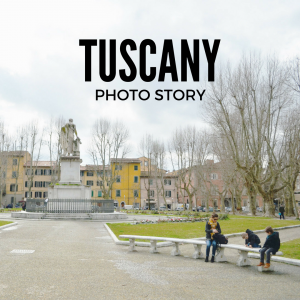 Check out our photo story from Tuscany. 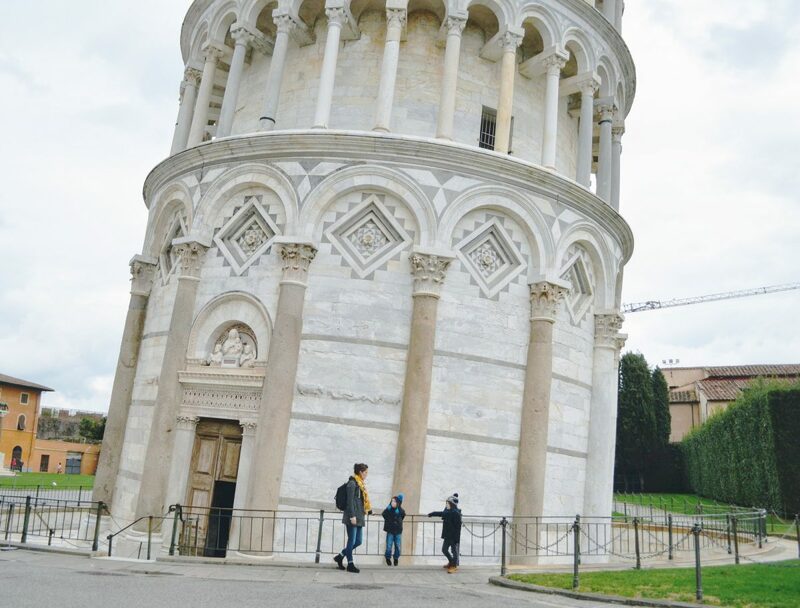 The Tower of Pisa, as it probably was meant to be called before it began its famous lean, is an incredible thing to see. Photos don’t capture the tower’s incredible inclination. Brittany suggests it might be that standing there in front of it you seem to feel the force of the lean; you find yourself wanting to lean the other way to compensate. We’d been to Italy before, to Venice, but Venice is about as singular a city as there is, and we’d been looking forward to seeing a more characteristic slice of Italy. Tuscany seemed like a great choice, especially with the cheap flights between Budapest and Pisa. So here we were in Pisa, peering up at the tower that, incredibly, had started leaning before workers had even finished its construction. And not just a little bit, either; the lean was so pronounced that the engineers in charge of the thing adjusted the upper floors to account for it. Especially looking at the uppermost level, that compensatory lean is quite obvious. It’s a gorgeous structure, built from marble mined from nearby. The adjacent cathedral and baptistry also are impressive in their architectural beauty. The cathedral, funded by loot collected in Pisa’s pillage of Palermo, was begun in 1068 and consecrated in 1118. The baptistry — which is separate from the cathedral because in the Middle Ages you had to be baptised before you could enter the church — was completed a little later in the 12th century. We rented a car for this trip. Despite the hassle of getting three boys buckled into two carseats and a booster in the back of a Renault Clio, we’ve enjoyed having a car for little road trips throughout the Tuscan countryside. Having a car also has clarified for us — for me, anyway — just how much we’ve appreciated not having one. 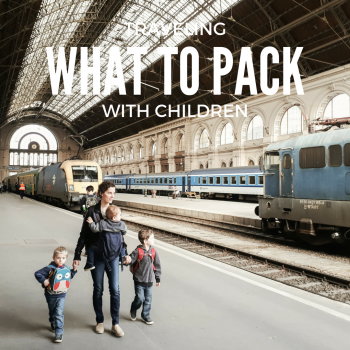 We drove out to a massive grocery store — the European equivalent of a Super Walmart, basically — and found the parking lot too large, the food selection too big, the choices too many. And the whole hassle took loads of time. 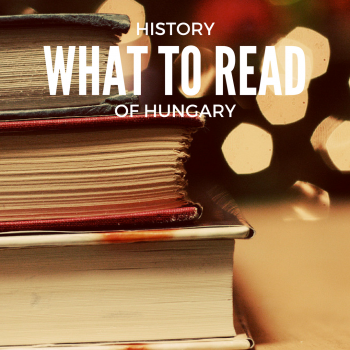 In the end, we found we preferred the smaller selection — reachable by a quick walk — that we have access to here in Budapest. Cars do offer freedom, but they also take some away. 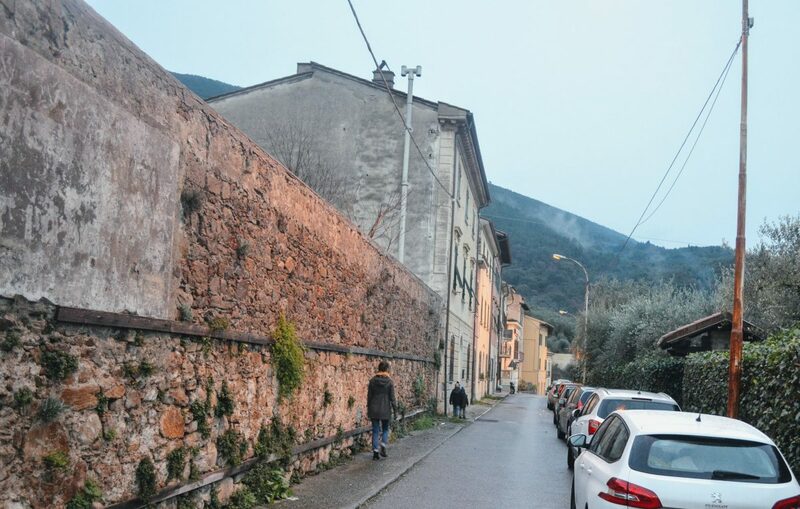 The street in front of our Tuscan villa is narrow, tricky for extracting kids from the car, so we’ve taken to parking in a lot just down the street. This morning, we calculated that the walk to the car here in Italy is about the same distance as the walk to the grocery store from our flat in Budapest — where we can just walk right in and buy food instead of bundling the kids in the car, driving 15 minutes to the grocery store, finding a parking place, walking to the store, drying off the cart from the rain… you get the drift. [su_dropcap style=”default” size=”3″ class=””]O[/su_dropcap]n the other hand, that car enabled us to drive out to Marina di Pisa, a small beach town about 30 minutes from Pisa center. What a gorgeous place! Our trip is in early February, so the hotels are closed, the restaurants shuttered and the streets empty. We would have enjoyed seeing the town in the bustle of summer, but the winter solitude also is just fine with us. Plus, the parking’s free and plentiful until around June or so. We park at the northern end of town, near the marina, and walk south along the Mediterranean coast. Our stroll starts at a jetty built from massive, gorgeous rocks, presumably mined from nearby. Some of these stones are marble and others are who-knows-what, but they come in amazing colors: blue, pink, orange, red … it’s beautiful. We let the boys clamber over them for a bit before I get nervous that they’ll get too high and tumble over the other side of the jetty, into open water. Headed south along the road, we soon come across the most amazing beach, entirely constituted of sea-tumbled white marble stones. Billions of palm-sized marble rocks, as far as the eye could see. 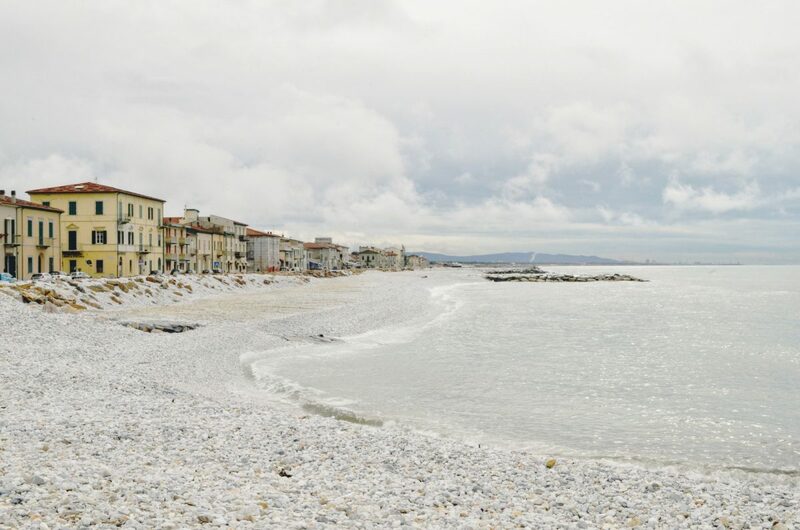 (The Italian province of Carrara, with its well-known marble mines, is just a few kilometers up the coast.) 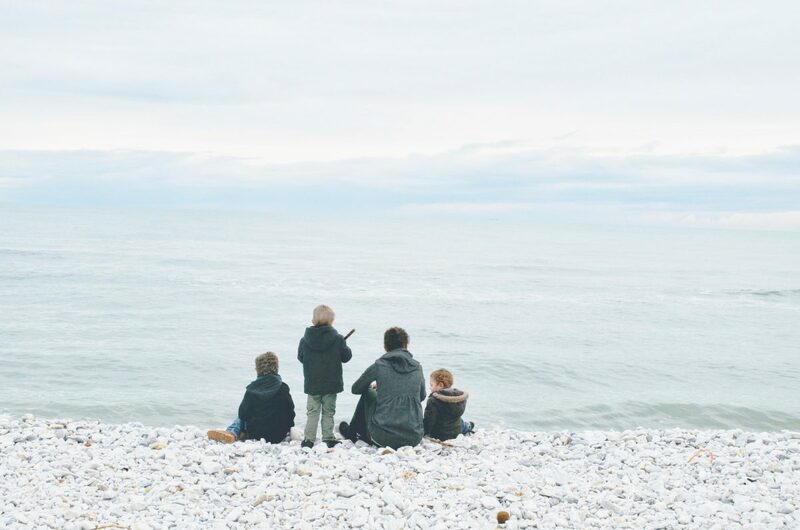 We catch a nice break in the rain, so we take our time walking; the boys enjoy the chance to be boys, throwing rocks in the sea, dragging sticks through the mud and hopping from stone to stone along the wall separating the beach from the street. They deserve this time and space. Enjoying a snack on the beach in Marina di Pisa, looking west across the Mediterranean Sea. We pause for a snack at the edge of the water, listening to the pleasant sound of rocks tumbling over each other as retreating waves draw them into the sea. The boys seize the opportunity to heave boulders into the water — “the big ones make big splashes,” Elijah notes — before we strap Job back into the baby carrier and turn into town. We’ve spotted some giant trees just a few blocks inward, and we’re eager to explore. The town is small, and we need walk only three blocks to reach what appears to be a small nature preserve on the other side. It’s criss-crossed with trails, and we walk a few before turning back to explore a gorgeous old church and then find our car for the drive home. It has been a treat to explore the variegated flora here in Italy; it’s different both from Hungary and from the Pacific Northwest. Here and there are orange and lemon trees, full of fat fruit. Large, flat cacti peek through fences, and palm trees pop up on occasion. 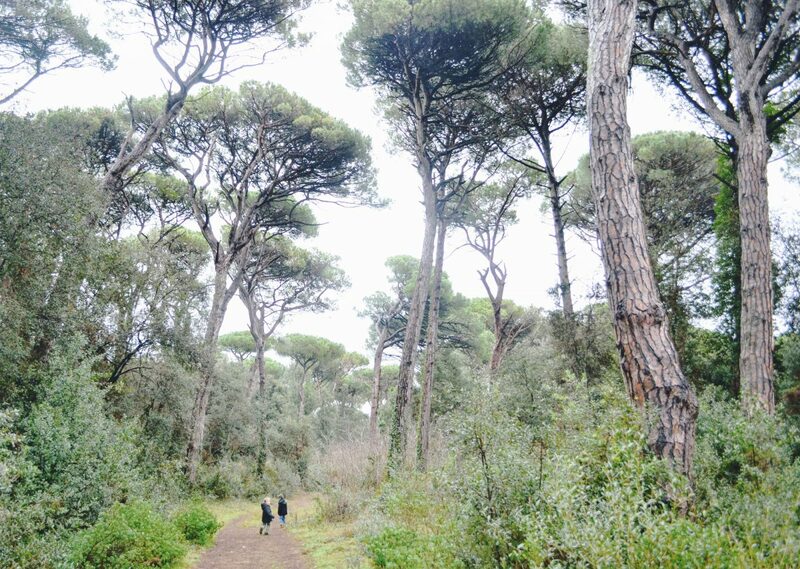 We also spot those classic Italian trees: tall, skinny Italian cypress trees that evoke images of Italian food labels, and Italian stone pine, often called “umbrella trees” for the broad canopy that sits high above the ground on otherwise branchless trunks. Both are native to the Mediterranean region. 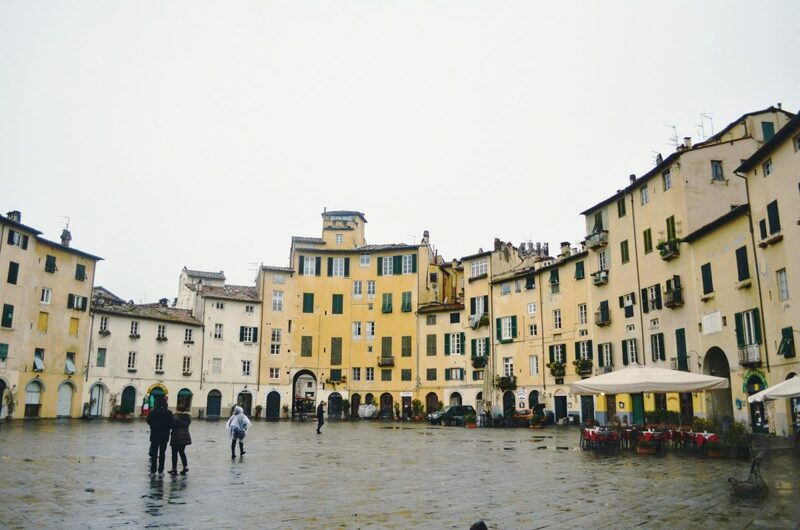 [su_dropcap style=”default” size=”3″ class=””]T[/su_dropcap]he next day we decide to make the short drive to Lucca to walk around the old city. Lucca, which was founded by the Etruscans and became a Roman colony in 180 BC, once was one of the most important cities in the region. During the Renaissance, which was born in nearby Florence, a massive wall was built around the old city. The wall remains today, and atop it is a walking and biking path lined with grass and trees that circles the entire old city. Our plan is to walk atop the walls for a bit before diving into the old city to explore the narrow cobblestone streets and old churches, many of which date from the Middle Ages. One spot on our list is the Piazza dell’Anfiteatro, which today is an oval-shaped public area ringed entirely by buildings. Its distinctive shape is due to a Roman amphitheater that once stood in its middle. The weather doesn’t exactly cooperate. It’s cold enough to be snowing in the hills just above us, and down where we are the rain is constant. We’re cold and wet, but the city is beautiful and we resolve to make the best of it. Brittany has packed us a lunch, so we huddle under the massive Porta San Gervaiso, a gorgeous gate completed in 1255. Keeping us company while we eat lunch are what appear to be a group of Italian school kids on lunch break, smoking cigarettes and chatting rapidly in Italian. Lunch rejuvenates us a little, so we manage to catch a few more landmarks in town before stopping for ice cream (here, gelato! ), which has become a Saturday tradition for us, and dragging our disheveled selves back to the car. [su_dropcap style=”default” size=”3″ class=””]W[/su_dropcap]ith the weather forecast looking decent, we decide on another day to pile into the car for a drive to Florence. The birthplace of the Renaissance, Florence is an hour’s drive away via the autostrade, which carries a toll of roughly 5 euros each direction for this stretch of the route. It’s easy to pay via credit card and not much of a hassle, so we don’t mind. The drive is easy. In Florence, we find some street parking — the spaces with the blue stripes are public; white stripes are for residents only — at the edge of town and walk into the city center. 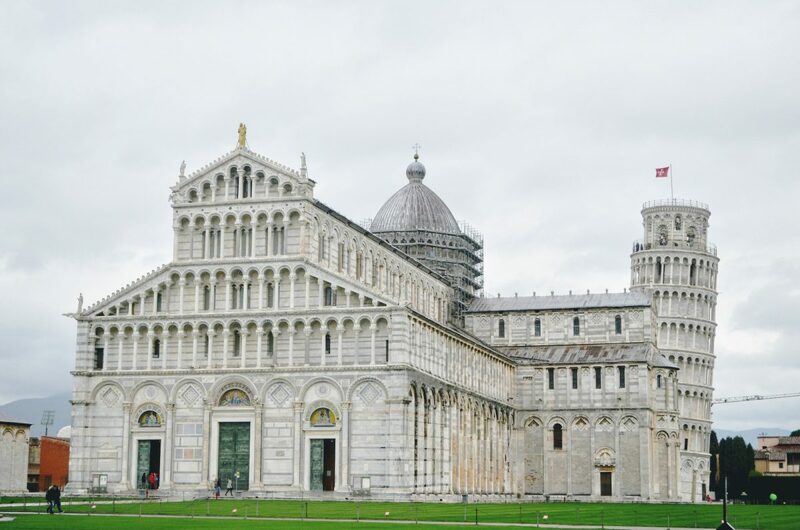 We take great care not to drive into the city center, which, like in Pisa, is a restricted zone and carries heavy fines for traversing without a permit. What a beautiful city! It reminds us of a few other European cities; with its narrow alleys, beautiful buildings and gorgeous old architecture, it’s a mashup of Venice, Barcelona and Zaragoza to our eyes. 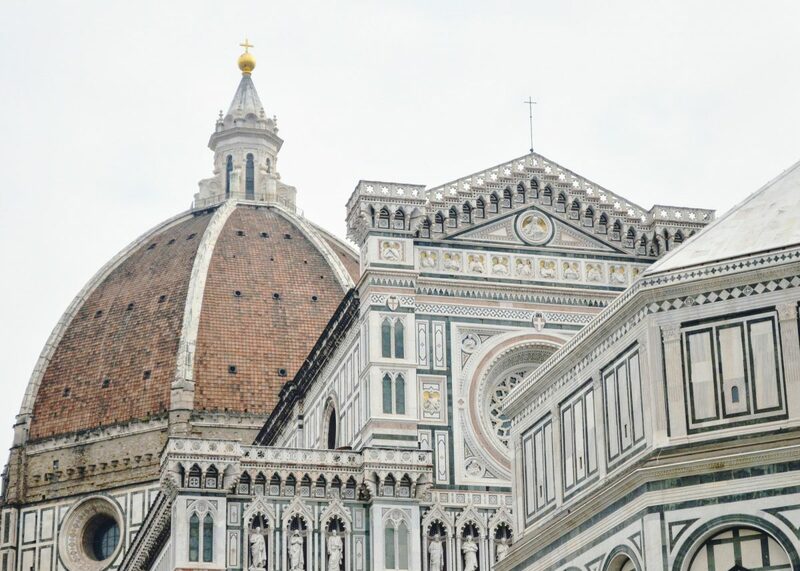 For the past 600 years, the city has been tied to the Renaissance; artists such as Michelangelo, Leonardo da Vinci and Donatello created beautiful works in the city, and the Cathedral of Santa Maria del Fiore is often considered to be the building that kicked off the whole movement. One of the first famous buildings we encounter is the Basilica di San Lorenzo, a Catholic church linked to the famous Medici family, which produced three popes and two regent queens of France. The Medici were a rich banking family, and through their commissioning of art were responsible for much of the work of the Renaissance. There’s a long line of people queued to enter the church complex, which houses the burial place of the Medici family and features artwork by Michelangelo, Donatello and Brunelleschi (who designed the massive brick dome atop the Florence Cathedral). With three oft-loud kids in tow, we’re not really planning on entering any famous buildings and enjoying the art, but we do wander into a nearby museum that seems to be free. We peek in and are immediately offered a private tour of the building, which is actually the longtime residence of the Martelli family, who were connected to the House of Medici. A kind tour guide leads us through the Museo di Casa Martelli, which essentially is an old Florentine palace and private museum now converted into a public museum. Rooms are displayed as the family lived in them. In one room, there’s a door to an old safe — one of the first of its kind, we’re told — that requires a complicated series of steps using various keys to open. If the keys are used in the wrong order, a piece shoots out of the safe and attempts to stab the would-be thief in the abdomen. We pass through other rooms — a ballroom, a performance space, a bathroom that’s painted to resemble the outdoors, a couple rooms full of art — before thanking our guide and heading back out into the streets. 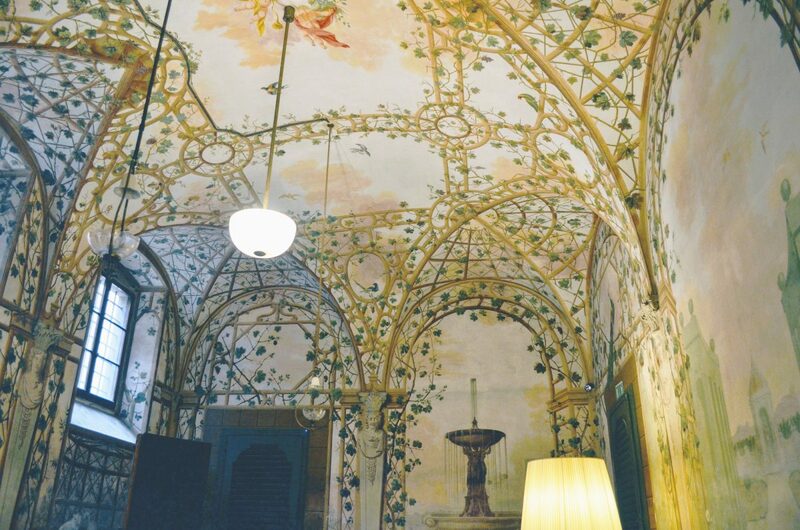 A painted ceiling inside the Museo di Casa Martelli. Around a couple of corners, our jaws drop as we get our first glimpses of the Florence Cathedral. We’ve seen the dome already; it rises high above the city and is visible from many places around town. But a close-up view of the walls of the building reveal a structure of indescribable intricacy, detail and beauty. It’s easily one of the grander cathedrals we’ve seen on our travels. We take several circuits around the building to appreciate its beauty before pausing for lunch — and attracting a flock of pigeons — then move on. 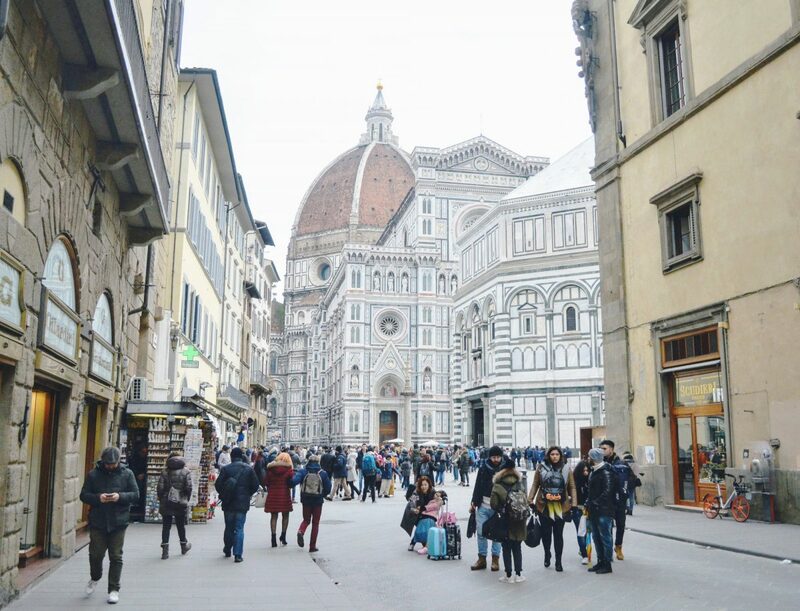 We spend a full, long day in Florence, walking all over the city. Up the hill to the San Miniato al Monte and Piazzale Michelangelo for expansive views of the city. Along the Arno River to check out the Basilica di Santa Croce di Firenze. When the sun starts setting, we’re still miles from the car and beginning to drag. We poke our heads into a coffee shop and pizza restaurant for refreshments that perk both our tall and short people up a bit. Outside our little rental flat in Agnano. 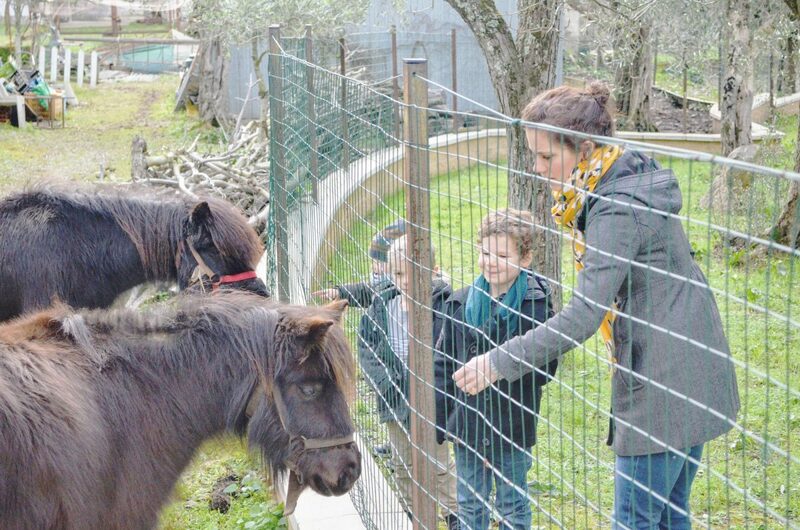 [su_dropcap style=”default” size=”3″ class=””]O[/su_dropcap]ur home for this little adventure is in Agnano, a small Italian village on the outskirts of Pisa in the Tuscan hills. The town consists of just a few streets, wending through the hills, with great views of the countryside below. It’s an Airbnb listing that once was the primary residence of the woman who meets us and shows us around. It seems as though the house is just the way she left it. The bookshelves are full of books in Italian, the linen closets packed with odd towels and tablecloths. Various trinkets and decorations cover most surfaces in the flat. Brittany comments that Italians seem to have a “more is more” mentality when it comes to decorating, indoors and out. For us, despite the constant danger of the boys breaking things while darting through the house, it’s great fun to live in an authentic Italian home for a time. Hungry for a hike in the woods, we find a few trails that wend from our flat up into the hills, past clucking hens and groves of olive trees and a fast-flowing stream that offers a pleasant background noise to our hike. The trail appears to continue in a large loop through the forest, but we never have time to complete the whole thing. On most days, rain is always a threat, but we enjoy these walks. Just down the street, there’s a little playground, and beside it a small fenced lot with a couple of brown ponies to which the boys feed blades of grass. Several times on this trip, Brittany and I comment that Tuscany truly feels like the Tuscany we’ve read about and seen on TV. It doesn’t feel like we’re just anywhere; it feels thoroughly Tuscan. Italy is just one country away from Hungary — separated only by the length of Austria — but it feels like a completely different place, and that’s been a fun part of the experience.